ICE has been conducting raids across the District. These raids are thoroughly unjust and an affront to the immigrant populations that fill a crucial role in our city and our country. Housing Up vehemently opposes the treatment of immigrants under the current administration, and will do what we can to support those in need. 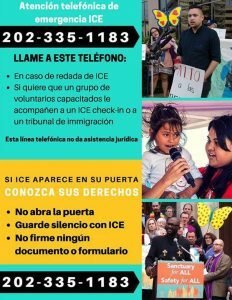 In order to counteract this and protect as many people as possible, we have attached a memo and flyers on how to act if approached by and ICE agent.